It’s time for your first family photo session: your chance to capture beautiful memories of your family that you can hang on the wall, share in Christmas cards, and look back on for many more years together. There’s just one problem: in order to get those perfect pictures, you have to survive the photo session! 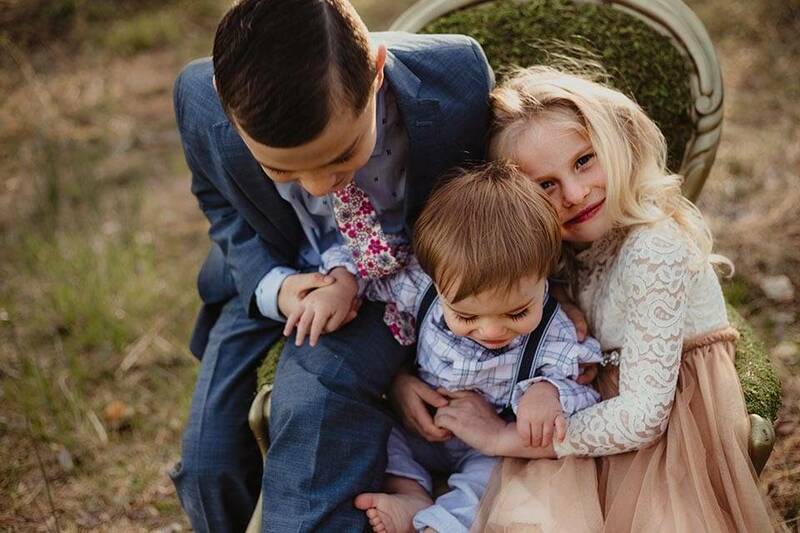 If you want to capture the best pictures possible, try these tips for making your family photo session not only survivable but amazing. Let’s face it: no one looks their best with bags under their eyes and their hair wild because they rolled out of bed too late to take care of normal styling. Instead of tired eyes and grumpy faces, have family photos that reflect your family members looking their best! Turn in a little early the night before your photo session, and try to avoid scheduling it the morning after a big event that could have you up late. You’ll be amazed by how much easier it is to come in calm and collected when you’re well rested. Sure, you want to be sure that you look your best for your stunning family photos. You also want to be sure that your kids aren’t scratching and twisting every time they think the camera isn’t looking (or, worse, even when it is). Bring along a change of clothes so that you can change into something comfortable for more candid pictures after the posed, formal shots are done. We’ll make sure to cover all the bases. Call me today and let’s book your family photo session, we’ll get pictures that match what you envisioned for your perfect family photo session, and then some! Chances are, you’ve got some great ideas concerning where you’d like to have your session. Let’s talk about it! I have experience shooting in a wide range of different locations, including both inside and outside. We can get great pictures anywhere, but you might, for example, be fairly uncomfortable sweating away outside in the middle of summer or shivering in the middle of winter. Think about some local ideas of where you would like to have your session, and we’ll work on it from there. Just like you want to leave plenty of time for sleep, you also want to leave plenty of time for the session itself. Don’t leave yourself rushing out the door in a mad dash to get everyone there on time. Instead, set a schedule that leaves plenty of time for everything you need to do. When you aren’t rushed, you’ll find that the session is much more pleasant for everyone involved. Many parents decide that they’re going to “prep” the kids in the car on the way over. “Now, I need you to be on your best behavior while we get pictures done,” they warn them. 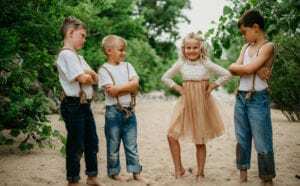 “Make sure that you aren’t running around and getting in trouble.” There might even be a threat of punishment or a bribe for good behavior involved. Here’s the thing: when your kids are desperately worried about how they’re acting, they aren’t being genuine. Their smiles are going to be fake and flat. The energy just isn’t going to be there. Instead, go into your photo session planning to have fun with your kids. Get a little silly with them. Laugh and hug as a family, just like you would on any other day. Play around a little. You may even consider bringing some props that reflect who you are as a family, or that will at least make the kids giggle when everyone starts to get grumpy. You’ll get much better pictures and feel a lot less stressed as a result. I promise you your session will be an absolute BLAST! Give me a call me today and let’s book your family photo session so that you can save these smiles and laughs for a lifetime! Not everyone has to be looking at the camera and smiling at the same moment to get an amazing picture. In fact, some of the best shots I’ve taken of my clients in the past had them looking at each other, not the camera! Don’t get caught in the trap of believing that the perfect picture only happens when everyone is standing still, focusing on the camera, and smiling perfectly. Instead, take advantage of the moment! If you do fall into the trap of wanting that greeting card photo, however, avoid focusing on your children and trying to force them into line. Let me take care of that part! I’ve taken a lot of pictures where I finally got the kids looking at the camera, and Mom or Dad was looking at them with an annoyed expression instead of smiling. Focus on you! Make your smile bright and your attitude positive. You’ll be a lot happier with how you look in those pictures. Does Dad tend to get a little cranky if he misses mealtime? Do you know that you get impatient as you’re rolling closer to lunch or dinner? What about the kids: do they start to fuss more when they go too long between meals? If you’re like most families, the answer is a resounding yes! Here’s the thing: photo shoots can take a long time. If you’re hungry, you aren’t going to be smiling for the camera— eat a mini meal or a snack right before your session. It will keep everyone a lot happier. It can also be helpful to bring an emergency kit filled with snacks and drinks…just in case. I’m not sure there’s any such thing as a perfect family photo session. Stuff just happens, often when you least want it and least expect it. Maybe the kids are a little too energetic, the wind is a little too strong, and everyone takes turns blinking during each picture. You can get frustrated. You even deserve to get frustrated. After all, these are your pictures! Or you can laugh it off. Enjoy your time with the kids and in front of the camera. When you make the best of the situation you’ve got, even if it wasn’t the one you imagined, you’ll find that it’s a lot easier to get great pictures. Even better, you may get pictures that you like more than you thought—and you’ll make incredible memories that you can look back on later whenever you see those pictures on the wall. Everything’s falling apart? So what? You’ll have a great story to tell later—and another amazing memory of life with your kids. 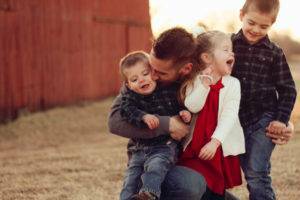 Family photo sessions don’t have to be stressful. In fact, they can be a lot of fun! 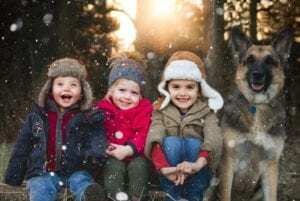 The trick is going into them with the right attitude: that you’re going to enjoy yourself, make some great memories, and capture images that you can share with your kids in the future. You love adventuring with your family, and this photo shoot is just one more adventure. Let yourself thrive in the middle of it! So go ahead and call me today so that we can book your family photo session now that you’re more than prepared! I can’t wait to make your dream family session a reality!